It happens every year. The kids go back to school, the visitors taper off, and we are left with one of our park's best kept secrets: September, October, and November are the best times to visit Glen Canyon National Recreation Area. Don’t get me wrong. 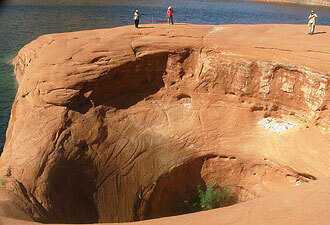 Glen Canyon is one of the prime destinations in the country for summertime fun. From houseboating to hiking, and everything in between, there's something for every kind of visitor. There is just something about the nip in the air, the glassy stillness of Lake Powell, and the gentle shift in the attitudes of the locals from frenzy to calm, that makes autumn a magical time. I know, because I experienced one of the three perfect magical moments in my life on Lake Powell in autumn. It was my first season at Glen Canyon National Recreation Area, in late September. All summer I had put off and put off learning how to drive a boat because other rangers would give me rides. As the other rangers left for the winter, though, it became pretty clear that I should get my boating test, and soon. 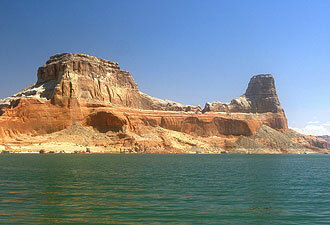 After that, I would be able to rove the lake on my own, visiting campers on the shores of Lake Powell. One day, I took a lunch break and motored into a small side canyon. I was immediately in another world. The white canyon walls reflected the water shadows for dozens of feet above my head. The sun shone in as a ribbon of light, warm to the touch. Outside of the light the air was cool and still. So was the water. I was far enough in the side canyon that the light and shading of the canyon made the water look a deep green. At first, the boat lapped against the canyon walls, but it eventually calmed and sat, perfectly still, suspended in water and air. I looked over the edge of the boat and a dozen sunfish looked back up at me. I moved forward and they disappeared, each with a tiny splash. Carefully, I stepped to the other side of the boat, looking for the sparkling fish. But they felt the vibrations of my shoes and slipped away every time I got near. In those moments of stillness and excitement, time could have stopped. It might have. It was a perfect magical moment. 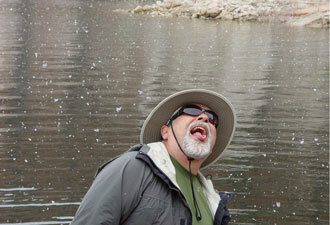 Every visitor to Glen Canyon deserves a perfect magical moment. And if you can get away in fall or winter, come see if you can make yourself some magic. The still water, breathtaking natural features, and blue skies hold enough enchantment for everyone. You don't even have to go all the way out on the lake to find something wonderful. Take a tour of the Glen Canyon Dam at the Carl Hayden Visitor Center. Come to the historic district at Lees Ferry and hike up the Spencer trail, or relax at the Lonely Dell Ranch. If you find yourself in the upper portion of Glen Canyon National Recreation Area, take a scenic drive up the Burr Trail. What’s going on right now? Check our event calendar and our Facebook page.